The Rev Margaret Moon, is plump, short-sighted, and down-to-earth, with a "round, cheerful face", and is the recently appointed vicar at St Mary's Church in the village of Stretton Noble In the Thames Valley. She had previously served in an inner-city area, "a frenetic, dynamic place throbbing with the urgency of the human need which lay, visible as an open sore, on every side", where she had enjoyed working as deacon then curate. When her bishop had told that he was moving her on to St Mary's, where she would be in charge, she wondered if he "had a sense of humour, there was little doubt that the Almighty did." For her new flock was made up of "sleek, well-fed city folk aping what they imagined were country ways with their waxed jackets and Barbour wellies and Range Rovers to tackle, morning and evening, the threatening terrain between the village and the nearest Thames Valley railway station, all of four miles away". "Oh Lord, she prayed silently, help me to be a catalyst for change. Help me to break apart this deathly smugness, and open up their hearts to real emotions once more." She seems a real priest, although, it must be admitted, she is not really a detective, but just somebody to whom people will turn to help and readily confide. But it is what she is told that leads to the solution of the mystery. 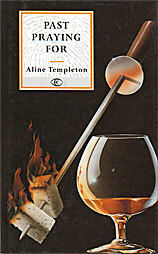 Aline Templeton is a well-known Scottish writer who grew up in a fishing village in Fife. She read English at Girton College, Cambridge, then went on to work in education and broadcasting. She has written some nine novels, as well as numerous articles and stories for national newspapers and magazines. She lived in one of the most beautiful areas of Perthshire, where her husband was warden of Glenalmond College. She now lives in Edinburgh. She is a Justice of the Peace, and has a grown-up son and daughter. Past Praying For starts with a chilling prologue describing the suffering of a neglected little girl and its terrible consequences not only then, but, as we shall see, in later life. It is years later that The Rev Margaret Moon, and her brother Robert, a forensic psychologist, realise that there must be somebody among her parishioners who had a childhood trauma so severe that it fractured her personality. But who is she? Who is the malevolent Missy's ego? Is it Elizabeth, battered wife and domestic martyr? Laura, controlled schoolmistress, smarting under the pain of professional rejection? Suzanne, who is rapidly estranging herself from her husband and son? Or is it the beguiling half-American Harley? When poison pen letters start to arrive, and arson leads to death, Margaret and Robert find themselves getting more and more closely involved, and it is Margaret who discovers, in a final, unexpected twist, that the case which the police thought they had closed, is far from that. It makes a powerful story with its confrontation of unhappy people, including one who "hated Christmas", and another who is found "kicking the sleek green Aga at the far side of her expensively countrified kitchen: 'I can never get the temperature right, never. I hate this bloody thing!' " And even Margaret, tired out by taking three Christmas services in twelve hours, was feeling "irrelevant. That was it. They (her congregation) viewed the church as little more than a social club in refined surroundings where you could be sure of not having to encounter the undesirable element." And although "she liked her own company .... she did wonder whether a bachelor vicar, new to the charge, would have received not one single invitation for Christmas Day?" But she brightly tells her psychologist brother, "It's all gone very smoothly indeed. Not a response missed, lovely singing, lots of happy families. I'm just putting my feet up in the consciousness of a job well done." "I see." There was a pause, then, "Depressed, are we?" "Remind me," she said darkly, "in my next incarnation, not to choose a brother who is a psychologist." They make an effective team and prove a considerable help to police inspector Rodney Vezey who does nearly all the real detecting. Another lively character is Minnie Croke who "came to 'oblige' at the vicarage for two hours every week. This was not an arrangement of Margaret's making; Minnie was a trial inherited from the previous incumbent." Margaret had kept her on, on his advice, as Minnie was an inveterate gossip who knew everything that was going on and provided a contact point with the "have-nots" and reaching them "was a serious problem". Minnie hints to Margaret about "queer goings-on" and suggests that the first victim who had died might not be the last. Minnie's eyes, dull and opaque now, surveyed her malevolently. 'Me? How would I know? Nobody tells me anything.' With which pointed remark she switched on the Hoover and fell to pushing it to and fro across the carpet tiles with a fine show of industry, ignoring the whistle indicating that the bag was already full." 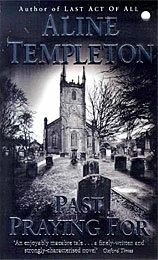 She and her dreadful old mother much complicate police investigations, although eventually she does learn her lesson. There is effective use of humour and, towards the end, the suspense is effectively built up, although there is not really a very happy ending for Margaret who thinks she had failed her flock for "a more skilful shepherd might have gone out and bought back the one who was lost." The author has her own website. There is also information about her on the Scottish Book Trust site and there is an interview with her on the Books from Scotland site. The two covers are very different. The UK 1st edition (the lower picture) may be the less dramatic, but it is the one that more closely matches the content of the story.